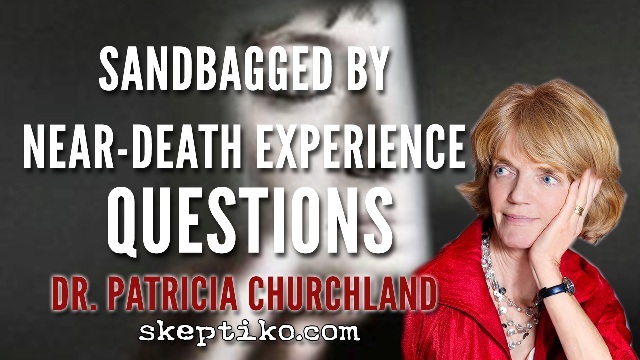 Interview with neurophilosophy expert Dr. Patricia Churchland reveals a lack of understanding of near-death experience science. what a childish fake dr churchland was. i dont know how you did it. you are very professional alex. i probably would have snapped. I rather enjoyed dr churchland's childish behavior. It revealed how weak and contrived their position is. I would absolutely love to see Alex, armed with all of the evidence of ghosts, ghostly attacks and ghostly activity caught on video) interview a skeptic neuroscientist. Perhaps you'd like to start a separate thread linking to specific examples of the best evidence. Though I'm open-minded on the subject, I've come across a number of videos which aren't, to me, particularly persuasive. Getting evdence of he paranormal is a question of how much risk you are comfortable with. I really found the TV series The Haunted, by Animal channel, to be very persuasive to me that disembodied spirits can attack, scratch, bite, shove people dow stairs, invade your thoughts, invade your dreams, harass your pets, etc. I'll invite you when I get home from work. Oh man, sorry to hear the thread died. I'd have loved to have seen the comments. I read Dr. Churchland's "Neurophilosophy". I would not recommend it. Part 1 was a rehash of old philosophy found in any intro philosophy book, and part 2 was a rehash of 1980s neuroscience (what a neuron is, how action potentials work, etc). However, this "interview" was simply amazing. Talk about pulling back the curtain on the Wizard of Oz and seeing the scared little man there (in this case a woman). Wow! Sad. Not much else to add to Alex's conclusion about what a joke academia can be. It can drive a bleeding heart liberal to want to be a neocon and gut this system. Churchland was objecting to a black & white analysis of NDEs. We don't know if they exist, but Churchland suspects they don't, based on what she does know about neuroscience. You can't expect her to prove that is DOESN'T exist, your job is to disprove her objections. That requires getting into weight of evidence about other neural explanations, not black & white. For other forum readers, Mr. Morgan's book begins: "I am a lawyer from Melbourne, Australia and I have been interested in human evolution since high school in the 1970’s, but only casually and not professionally." Churchland didn't really explain herself in the interview. She was clearly put off and unprepared. NDEs certainly exist, just like dreams do. It is just that people debate as to the nature of such experiences. Thank you for sharing your writing. You may like my recent book. It provides a counter-point to yours, and it has no equations in it either. Opps, sorry, I mis-spoke. There is an Appendix that explains what a limit is in the Experience book. Don, you have done me a disservice. You skimmed the book, you have not read it, and the mere absence of equations somehow proves it is not worth reading. I discuss the equations of science in plain language, and nothing at all is lost in doing so. Pity you didn't read it. You are being superficial, and you are mistaken. Perhaps if you actually read some of it instead of skimming, you might discover this for yourself. Others are certainly encouraged not to skim or make erroneous assumption, and to actually read it. I forgot to ask, what is the point of my book to which you provide a counter-point (with no equations ans somehow avoiding derision for that)? I see no indication you have even read it, just skimmed, and certainly no summary of my "point". Again I find that superficial and lazy. What exactly is my point, and what is your counter-point? Her husband also engages in this kind of shoddy, deceptive materialist evangelism. Not to worry, this thread is alive and well. I am counter to view expressed so far in this thread, which makes it a healthy thread. Nothing worse for progress than everyone just agreeing with each other over obviously disputable claims. Churchland is not the way you make her out to be, but that's an issue of your manners. What do you think Churchland is right about? And do you think she correctly represented the beliefs of Van Lommel? Likes: Doppelgänger, Ian Gordon and K9! I skimmed the book. Didn't see one equation in it. Equations are important because they are the language of science. You can be as prejudicial as you like, or suspicious by another name. I'm not fussy about such things, they are commonplace nowadays. The point is, do you understand what you are saying? Do you actually see the point of the book or any points in the book at all? You certainly haven't given any indication that you do, in what you have written. The problem is that you make a judgment with no stated basis, except "suspicion". If you explain your suspicion perhaps I can alleviate it. If your concern is that Metaphysics is not possible without a "creator", then read further. The book is extremely comprehensive, just start at pages 9 & 10 and dispute that error in biology, then proceed if it interests you. Basically, I leave no gaps for magic to inhabit. Nature is merely processes of compression and decompression (action-reaction) at work. Action-reaction is very useful to frame existence.